The winning team in the final Ken Briggs Memorial Golf Tournament, from left to right, Ryan Briggs (Ken Briggs’ son), Brent Carter, Bob Carter and Tim McGraw. Winning team member Jeremy McGraw was not present for the photograph. 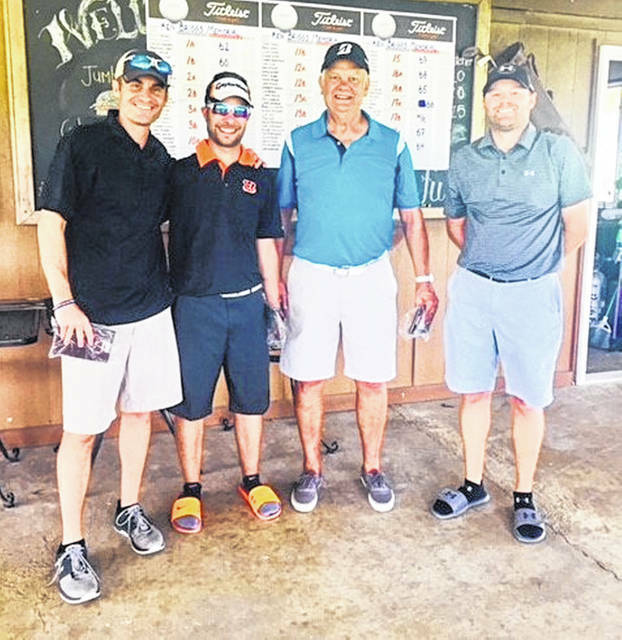 The team of Bob Carter, Brent Carter, Jeremy McGraw, and Tim McGraw won the fifth annual, and final, Ken Briggs Memorial Golf Tournament at Majestic Springs Golf Course. In all, there were 22 teams in the field. Following the Aug. 4 event, awards were presented on the picnic patio. Griffin Shaw received the longest drive award and Tim McGraw and Chad Fentress shared closest-to-the-pin recognition. The proceeds from these golf outings are given each year to organizations that were important to Ken Briggs. The first year, the money was divided among youth athletic organizations in the East Clinton, Fayetteville and Clinton-Massie school districts. The second year, the Sabina United Methodist Church received a contribution. The third year, proceeds provided for a freshman basketball team at Fayetteville High School and supported the golf and bowling teams. The fourth year, Christmas gifts were purchased for many children in Clinton County through the Ho Ho Shop in Wilmington. This year, proceeds will help pay for a new heating and air conditioning system for the Sabina United Methodist Church. Those who supported this fifth and final event are Sabina Farmers Exchange, Accurate Soils, Luttrell Trucking, Sams Meats and Deli, Oak View Farms, Rich’s Pool Service, The Haines Agency – Terry Richard, Uhl’s Family Food Service (in honor of the Uhl’s basketball team), Collett Farms Pioneer Seeds, Cincinnati Milacron – Pete & Carol Fentress, Mary K. Howard (in memory of Bill), Edward Jones Financial – Matt Greene, Metal Roof Consultants – Brad & Chuck Howard, Phil and Vicki Snow, Rose Excavating, Inc. – Marilyn Rose, Modern Woodmen of America (Matt Moore), Dean and Jo Ann Snow.